I just had the opportunity to review the newest release, Infected With The Blues by Spencer Mackenzie. Mackenzie is a 16 year old gun slinger with an aim to make a mark on the blues scene and this is a good start. 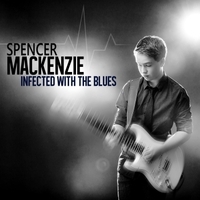 Opening with title track, Infected With The Blues, a contemporary shuffle track featuring Mackenzie onlead vocal and guitar. David "Groove Doctor" McMorrow provides solid piano solos and support with Alan Duffy on bass and Sean O'Grady on drums. A cool track with some clean guitar work by Mackenzie. Chicago style, Mess Around, has great horn support by Bill Holinaty on sax, Ryan Baker on trumpet, and Mike Polci on trombone. A high energy track gives Holinaty a great opening for a super sax solo and Mackenzie shows his cards as well. Very nice. Opening in old delta style, Devil Under Her Skin, fills out in modern style with warm bass lines and additional vocals by Sharon Riley, Rochelle Harrison, Camille Harrison and Dean Malton. Nicely blended lead vocals and with Max Hiller on harp and lead guitar work by Brant Parker gives this track a special feel. Memphis Minnie's, Kissing In The Dark has an Eric Clapton style arrangement but Mackenzies vocals have a different dimension. The maturity in the backing vocals give the track a richer feel and some of Mackenzie's nicer guitar riffs show on this track. Goodbye Lucille is one of my favorite tracks on the release with it's slow tempo and soulful guitar phrasing. Hot jump track, Jumpin' from Six to Six has a lot of energy and backed by the full horn section, this track rocks. Particularly snappy drumming by O'Grady and super piano work by Groove Doctor set off by a hot sax solo by Holinaty and a short smoker by Mackenzie gives this track real legs. Lowell Fulsom's, Sinner's Prayer, is another track with a lot of Clapton feel but Mackenzie's vocals are right at the edge of maturity. His phrasing is good but a little more thickness in his chords will benefit him on future releases. His guitar does do much of his talking for him and the maturity is really coming along nicely. Wrapping the release is Dylan's All Along The Watchtower, a la Hendrix. Again I really like what O'Grady brings to the table on drums. Mackenzie's riffs are solid and his vocals spot on. Soloing efforts on this track are real nice and backup vocals add nicely. A very cool first effort.